The Portal Content Directory (PCD) is the main repository for portal content, both delivered with the portal and created by administrators. The PCD contains a hierarchy of folders, each of which can contain semantic objects, such as iViews, pages and roles. An iView is a small program that retrieves data from content sources in a company environment and on the Internet, and displays it in the enterprise portal content area. Some iViews also allow the user to work with the data, for example, by modifying existing or creating new data units. From a semantic point of view, an iView represents a workstep by providing access to tools, information, or applications. A portal page is a container for iViews that are arranged in a layout. iViews that support related worksteps can be grouped together on pages. The content of the pages then represent business tasks, providing the tools the user needs to fulfill such a task. A workset that groups a set of related pages. Pages that support a given business process can be grouped together using worksets. The workset then represents the business process. A container workset that groups several simple worksets representing several business processes. Related simple worksets can be grouped together to provide the content for comprehensive areas of responsibility in a complex workset. 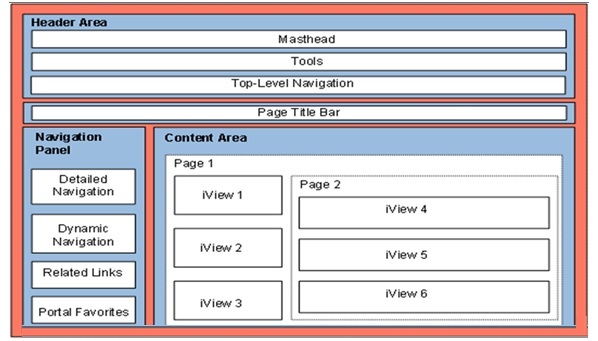 A portal role template is the largest semantic unit containing folder hierarchies consisting of worksets, pages, and iViews. These contain all the portal content objects that a user needs for his or her job role and determine which services the assigned users can access. They are also responsible for the visualization of content and for the navigation structure.